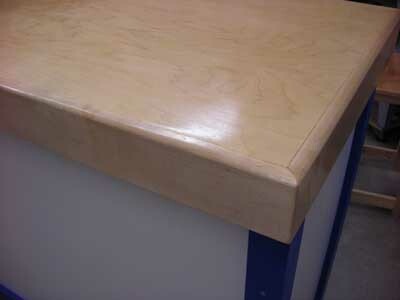 This dramatic maple counter can be yours for just $550. Measuring in at 53 inches wide, 26 inches deep, and 45 inches tall, it is a stunning yet functional piece. The front and sides are white melamine for easy cleaning. 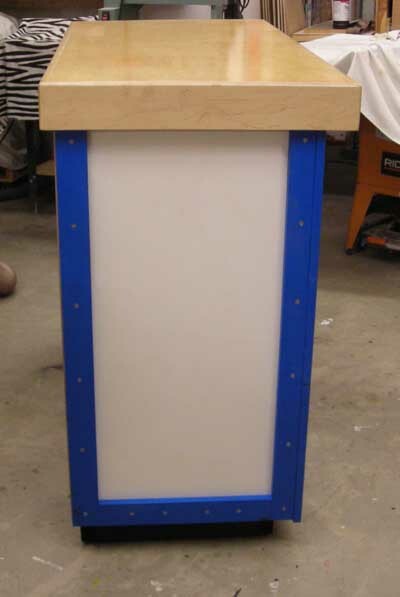 The trim is painted "BMW blue" (for the person who ordered then bailed on the project but we won't go into that) and the top is maple plywood with a three-inch solid maple trim border. We overhung the top forward by three inches to allow a light underneath. This way you can place your logo on the front and light it up. We used star-shaped screw heads to add a nice mechanical touch. There are four adjustable feet underneath so you can easily balance it when you get it home. 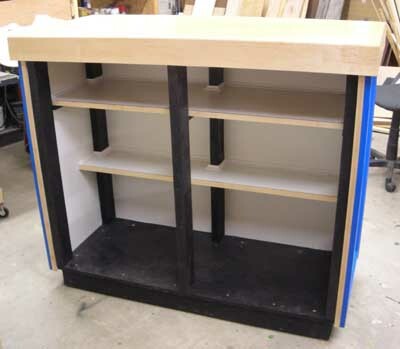 This fine maple counter has two fixed shelves inside. The lower shelf is set back a few inches to allow room for your legs when you stand or sit behind it. These shelves are strong enough to hold just about anything you want to place on them. 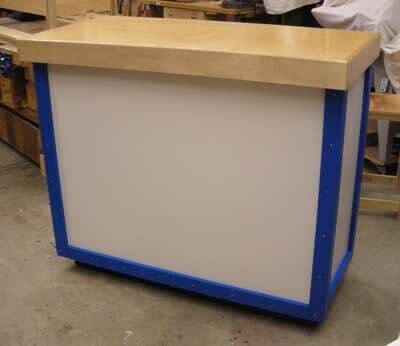 The top is strong and durable with a TruOil glossy finish. Clearly this is a nice piece that will look good as a bar in your home, as a counter in your shop or store, or on your covered patio.We do not recommend using or placing it outdoors. You can benefit from our mistaken trust by taking this home for just $550. Original price was much higher (and wasn't the cause for the original guy to back out, but you can tell I'm over it, right? Lessons learned). Sorry, but this unit is too heavy to ship thus can can only go to a local buyer. Two guys can move it with a small pickup, but shipping costs for outside transport will make this unreasonable. It is currently on display at Valley Discount Tire Center, 7139 Canoga Avenua, Canoga Park, CA, corner of Canoga and Sherman Way. This is a brand new unit, never used or installed.